Like this craft? 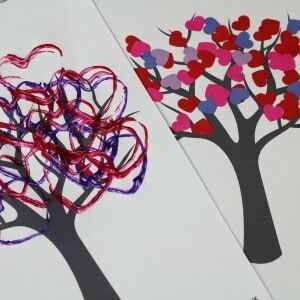 Make sure that you bookmark this page or pin an image so you have it to hand when you need it plus keep reading for more easy Valentines Day crafts for kids. I’d recently implemented a ban on glitter in our house which is one of the least popular decisions I think I’ve ever made. For me, I know that it gets stuck to my kids hands and then as it gets washed off it will inevitably end up in our oceans. I love glitter but it had to go. For my daughter? Well she’s four and as much as she loves the sea and wildlife, glitter is EVERYTHING. Buying some glitter card has been a halfway house for us as she gets to use sparkly stuff and I don’t have to worry about it going down my drain, needless to say she was super excited when I showed it to her. 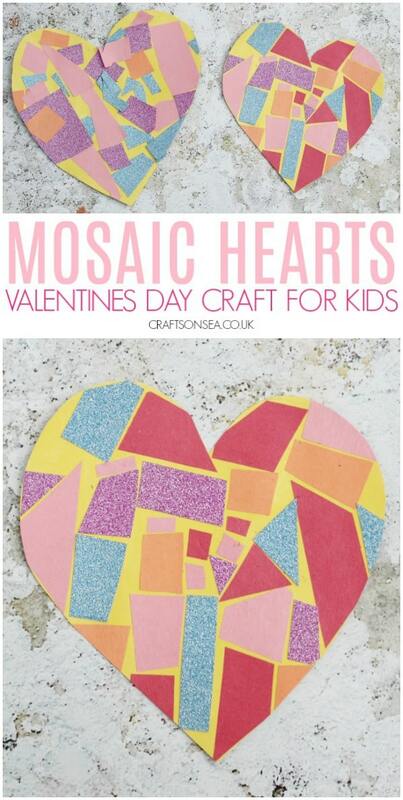 To make your mosaic heart start by drawing a heart shape onto some card as a guideline and then cut your glitter card and construction paper into little shapes, this is a good excuse to talk about different shapes too and we found squares, triangles, diamonds and rectangles. Next cover your heart in glue stick glue, I’d recommend this more than PVA for this craft as PVA is just too messy for little bits of paper and card. 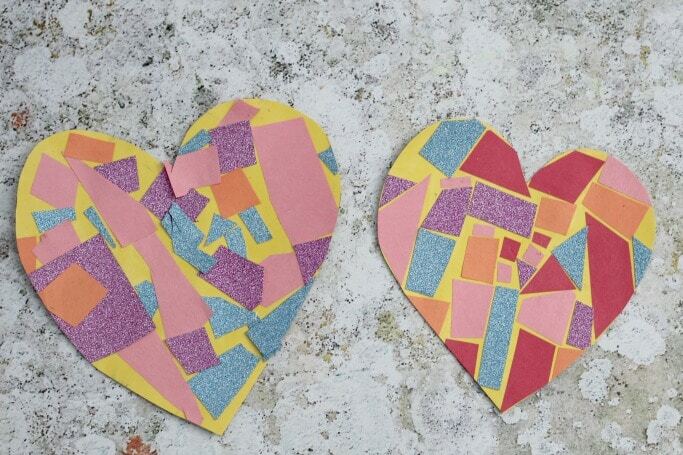 Stick the cut bits of paper and card onto your heart trying to leave a bit of room at the edge of each piece for a mosaic effect, this is good for fine motor skills too. I always know when a craft has gone well by if my kids want to pose with it at the end so I think it’s safe to say this one was a winner! 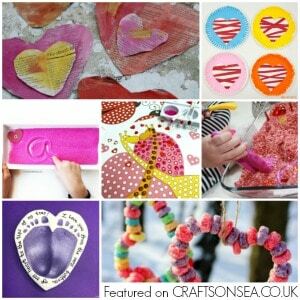 We’ve shared six ideas for Valentines tree crafts plus you can use our free tree trunk printable to make preparing this craft that little bit easier! 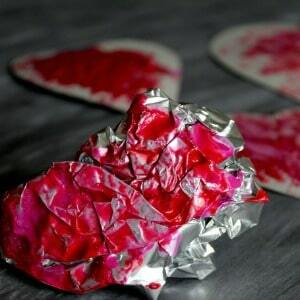 This foil painted Valentines activity was a big hit at our house and would be good for the front of a Valentines card too. 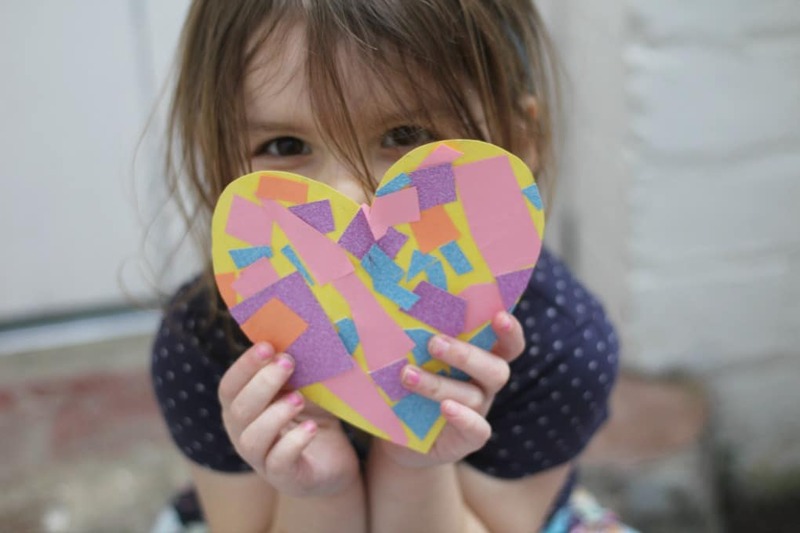 Want more Valentines Day activities for preschoolers? 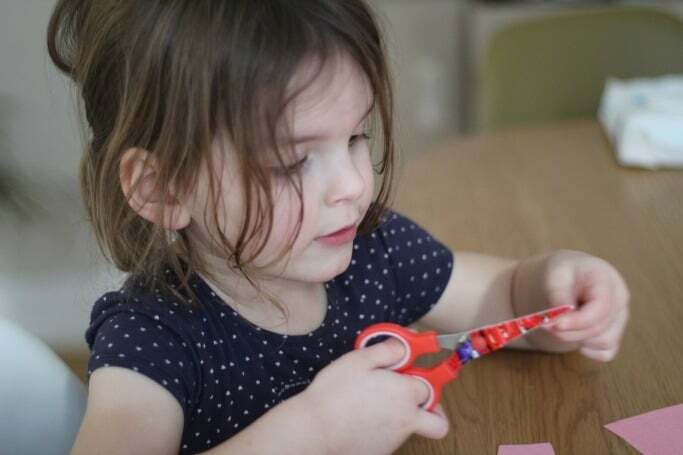 Check out our round up with over 60 fun ideas.